As women, we have unique nutritional needs. And because we know that women play hard and never quit, we created IdealLean Protein to meet those needs head on. Get ready to get lean! I'm a studio gym owner, personal trainer, and fitness instructor. My wellness life is kinda hectic and I need a good isolation and recovery protein that I 'm also able to use as a meal replacement. The Ideal Protein is just what my body needed to keep my definition, calories lows and recovery time on point. Chocolate brownie protein is my favorite! I mix with milk and drink with no problems! Nice to know I'm getting the protein I need! Ordering the protein powder like this gives you a great deal, and you pay shipping fewer times (or get it free). I wish I would have took 'before' pictures of before when I started lifting so I could really see the results but I know they're there. I tried a couple different protein powders before switching to this and idealfit is definitely my favorite. Mixes up better, tastes better, and I've even noticed improved hair and skin since I started using this (could be a coincidence idk). I would recommend to friends and have already! My favorites kinds are cake batter, it has sprinkles:), and mint chocolate chip. I've tried loads of protein powders throughout the years, and I have to say these may be my all-time favorites! I always mix mine with almond milk in a shaker bottle, and it mixes smoothly--which is a big deal to me--and gives it a nice creamy texture! It's like a low calorie treat! I love the Chocolate Brownie flavor best, but Strawberry was good, Chocolate Mint was good, and Cake Batter is yummy as well! Let's just say I haven't tried a flavor I haven't liked yet! I have been looking for a protein powder that had at least 20 grams of protein, but didn't have so many calories. When I tried the sample pack, I knew this was it. As other reviewers have said, it is a little sweet but overall it tastes pretty good. The texture is thin, which is nice, since many protein powders have to be choked down. If you want a good protein that doesn't break the calorie bank, this is it. P.S.My favorite is mint chocolate which tastes like thin mints. I have tried 3 different protein brands; one being plant based. I was super excited to get the vanilla protein I ordered. However, I agree with the buyers who review and say it's way too sweet. This stuff is WAY too sweet and has a very fake sweet taste. I have to choke it down. No matter what I add to it (fruit, yogurt, or just drink it mixed with water) it would be so much better if they didn't sweeten it so much with a fake sweetener. Please please work on fixing this problem as many reviews state this too! I'm so excited to have found a Protein Powder that really works and taste amazing! Yes, I have my favorite flavors! So far I have tried them all, but my favorites are pinacoloda, strawberry cream and peach! They're ALL GOOD, but some are sweeter than others! I recommend doing what I did, try all flavors before ordering the tub! I have never tasted protein that was this yummy before! Absolutely LOVE IT! I love the ideallean protein powders. I bought the sample pack to try a variety and really enjoyed the flavor and texture. My favorite is the chocolate coconut. I love it as a shake with ice/almond milk and peanut butter. But really enjoy it with water which helps when trying to get added protein into my daily routine and not too many calories. I really enjoy the blogs, recipes, and information that I am learning from your products. If you are on the fence about this protein you should really give it a shot! Love this protein because it doesn't have anything else in it. 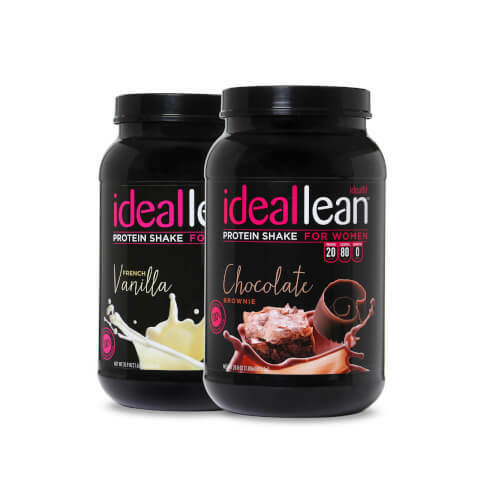 20 g of protein at 4 calories per gram = 80 calories... meaning no sugar or fillers! All of the flavors I have tried have been great. Seems expensive, but if you buy 2 tubs at a time, it ends up being just over $1 per serving. You'll pay way more than that at the grocery store for a lower quality product. OK, to say that I love this line of protein powder is the understatement of the century!!! The flavors are amazing and they mix tremendously smooth!! Flavors are subjective, so try several. I personally thought the cake batter was too sweet but for a sweet tooth, it might be the best thing ever! I will say, it was beyond easy to return it for a refund and just get a different flavor! Seriously, there's NO risk in trying it out! I currently have 3 different tubs of protein in my kitchen (I'm a variety kinda gal). I am a stickler for texture so I have to say, you will not find another protein powder that mixes as smoothly AND has the amazing flavor as IdealLean!!! It is an absolute game changer and is now a staple in my nutrition. Don't know how I ever lived without it!!! I recently purchased the Caramel Mocha flavor and I LOVE IT! Yes I did read previous reviews and read it was on the sweeter side. It definitely is,but I LOVE IT! I mixed it in with my coffee and i feel like I drink a dessert! Getting ready to order a bunch of the other flavors!! Can't wait! This is a must buy, since I've spent a lot of money on a lot of other protein products! I tried a few different protein powders, but IdealLean is my absolute favorite now and I won't ever buy anything else. I've tried almost every flavor and I love the French vanilla, chocolate brownie, chocolate coconut, and cake batter in shakes or other quick snacks from Trainer Lindsey's challenges. I haven't been a huge fan of the fruit flavors, but I have used them to make muffins and pancakes before, and they are okay that way. I love that each scoop is only 80 calories (instead of the 150 calories in each scoop of the protein I was using before) and it's really yummy. No grittiness like other powders I've tried, and I don't even need to add a bunch of other ingredients to cover up the taste of the protein. It can stand fine on its own. Thanks for such a great product! I absolutely love the smell and taste of this product!! I highly recommend. If you look at the nutritional facts, it's mostly just protein, which is actually really hard to find for women's protein shakes. Most other ones have extra fat, cholesterol, sodium, and way more calories! And the price is really affordable! Chocolate brownie is DEFINATELY my favorite flavor for this, and it doesn't get old I look forward to drinking my shake now. Thank you for making a yummy shake! !